GMAT Registration : MBA candidates can apply for GMAT through online registration process. Applicants can apply for GMAT by signing into mba.com, which handles all GMAT enrollment. Before finishing the GMAT registration, candidates are first required to plan their GMAT exam date at one of the test centers. Since there is no particular GMAT test date, applicants may pick a date as indicated by their comfort and accessibility of that date and time. Also, students who are not happy with their GMAT results can decide on a GMAT retest within 16 days of their past test. In any case, students can’t take GMAT more than 5 times in a year. Read below to know the GMAT enrollment stages and apply for the test. Create account: Aspirants have to log in and create an account for GMAT registration on mba.com. Under GMAT exam drop down, select Register and schedule a GMAT exam. Key in details like Name, Email Address, and Password. Then the candidates will be asked their communication preferences who will then have to click ‘Create Account’. The next page requires the candidates to verify their profile details. Candidates are advised to ensure that the information matches their ID. This is important because if the profile credentials do not match on the GMAT test day, the candidates will not be permitted to take the test. Neither will they receive a refund. The candidate may also be marked as ‘No Show’. Exam Scheduling: After the account creation, the candidates can then schedule timetable their GMAT test dates. A similar account can be further used to cancel or reschedule the exam or exam center. Students can also access their scores and send it to various schools as well. Pick GMAT Date: Candidates who register for GMAT can pick up to three GMAT Exam Centers to confirm GMAT date availability of their decision. When they select their preferred Center, the tests dates at the center appear. Clicking the preferred date shows its availability and additionally the accessible session slot to choose. Confirm Exam Details: As the candidates select the date and exam session, the following page shows the total profile also the selected date and slot to be confirmed. Candidates are encouraged to carefully look at all the data before they click next. Any changes in data can be information at this stage. 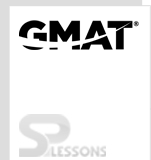 Complete GMAT Registration: The following page is the payment page. Payment for the GMAT Test should be possible with credit or platinum cards. Just Visa, MasterCard, American Express, JCB are acknowledged in the payment procedure.